(Amazon Go) Amazon opens its first supermarket without cash registers. The Amazon concept of the supermarket is called Amazon Go – the name says it all. Amazon opens its first stationary supermarket. After all, the customer walks through the supermarket without having to queue at the checkout. To purchase Amazon Go for iPhone and Android on your phone, you need Amazon Go. Techcrunch reports that Amazon Go’s QR code is quickly scanned on the roll when the application enters the Amazon Go supermarket. From now on, the cameras pick up customers and track them. Amazon has installed cameras throughout the supermarket, and sensors and scales are built into shelves that closely track every purchase and quantity and combine them with the customer’s application. Only in exceptional cases is a person obliged to confirm the purchased product. It remains to be seen whether the recognition of cameras by private individuals will also work for a large crowd of people and whether these individuals will gradually enter the market. Amazon emphasizes, however, that it does not use facial recognition. Instead, cameras should be able to reliably identify a client with other functions. Then customers simply go to the Amazon-Go supermarket and place their goods on the shelves of the shopping cart. The supermarket automatically registers the products selected by the customer and places them in the shopping cart in real time. When the customer returns the product, it is removed from the shopping cart in real time. Customers leave the supermarket. Without queuing up, without paying and scanning at the checkout, the smartphone can stay in your pocket as soon as you leave it. As soon as the customer leaves Amazon Go, their account is automatically debited with the amount of the purchased goods. It is said that Amazon has been working for five years on the concept of a cashless supermarket. The opening took place one year later than originally planned. 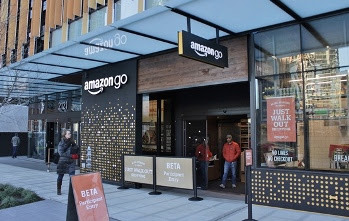 The first recently opened Amazon Go is located on the ground floor of Amazon’s new headquarters on Seventh Avenue in Seattle. It’s the only market in Amazon Go. In Amazon, Go customers will find fresh salad, meat, sandwiches, and drinks, including beer and wine, as well as a ready-made breakfast, lunch, and dinner. Potato chips, biscuits, and nuts are also available. Of course, Amazon Go employs staff despite the lack of cash registers. At the entrance and welcome customers at least for a moment, someone is standing there. Alcoholic beverages are served by an age-controlled employee and other employees prepare fresh food or store shelves. During the preparation phase, Amazon found out from the customers of the supermarket what worries them the most. The queue at checkout is the most common answer. So Amazon has eliminated exactly these inconveniences.